In this Kitchen Nightmares episode, Chef Gordon Ramsay visits La Frite, Sherman Oaks, California, a French restaurant opened in 1972, which was a big success. Son Alex was brought into the restaurant with sister Celine but they compete for ownership as their father Andre wants to retire. Andre visits Chef Ramsay at his restaurant to give him the background before he visits the restaurant, he explains the biggest problems are Alex and Celine. Gordon meets the manager Gail and inspects an ugly desert cabinet. Celine recommends the quiche Lorraine, he also orders a La Frite salad and a seafood crepe. The salad is large and bland with acidic dressing, the Seafood Crepe is soggy, hot in the middle and cold at the sides and the Quiche was microwaved. At dinner service, Alex arrives but he and Celine don't usually work the same shifts, he says the conflict is about who will inherit the restaurant. The dinner service is busy and Chef Martin sends out unseasoned and overcooked food. Gordon tells them it is the most disorganised restaurant he's ever been to and tells Celine to call her dad to come to the restaurant. He tells Andre that his children cannot work together and sits them down to restore the relationship. Gordon introduces a crepe station and removes the dessert case. For the evening's service, Alex is making crepes and Celine is in the kitchen but is ignored by the chef. Overnight Gordon gives the restaurant a makeover, introduces a new menu and brings in chef Chuy to support the kitchen. On relaunch night, the food begins at a good pace with the appetizers getting to the customers quickly but things break down when Celine asks Martin to communicate. He ignores her and the service slows down, with food taking 90 minutes to leave the kitchen. The customers begin to complain and one table walks out. Celine breaks down in tears and Gordon asks Chuy to take over. The food begins flying out of the kitchen and the customers are delighted with their meals. In the days that followed, Chuy was hired as full time Executive Chef and Alex and Celine are still working together. When Gordon revisits Celine is front of house and she reports they are doing well. Gordon also chats to Alex, who says they are getting along much better. Gordon orders a mushroom crepe and Andre sits down to join them, he says the crepe and quiche are both delicious. Yelp reviews following the filming of the episode were mixed. In July 2016 the restaurant had a re-brand and was bought by George Zaoui, who changed the restaurant to an Italian eatery Modo Mio in September 2017. 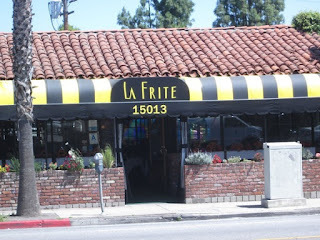 La Frite aired on May 20 2011, the episode was filmed in January 2011 and is Kitchen Nightmares season 4 episode 9. Solid episode. Crazy what a little sit down and talk accomplished for the family. Cook was single handling anchoring the restaurant. Nice to see them excelling. He always says it's delicious when he comes back... One time he said it is delicious and later discovered that he was given "Unchicken"... That shows how fake he is when he tastes for the first time the foods. I ate there this place blows, I would rather eat at Burger King. Back up your statement with specifics please. The Sunday brunch is still wonderful - Gordon Ramsay didn't change the menu and screw it up. I ate there too right before it closed. It’s honestly terrible. I had the duck and it was overcooked and flavorless. Cost something like $40. I’m happy it got sold. Before it went under, the main clientele was primarily old people. Btw I live right by there in sherman Oaks. I need to try out the new rebrand though. I used to love La Frite, but after Ramsay took 90% of the items of the dinner menu and added some new ones that are not good, I was appalled. I only eat there for brunch on weekends - same fabulous brunch menu as always - great food, great price. Say whatever you want, the fact that this restaurant kept open says something. Yes, Chef Martin, we know you're angry. You sound like you lack tastebuds. People saying the microwaved junk they served before was better... Crazy!